REVERE (November 5, 2018)— You got ideas, and we’re funding them. The mini-grant program, hosted by the Revere CARES coalition, is now accepting applications until January 6th for innovative ideas that promote a healthier community for all. Since its creation in 2012, the mini-grant program has provided over $100,000 dollars to fund community ideas that make Revere a healthy environment to live, work, and play. The mini-grant program is a collaboration between the MGH Revere CARES coalition and Revere on the Move. 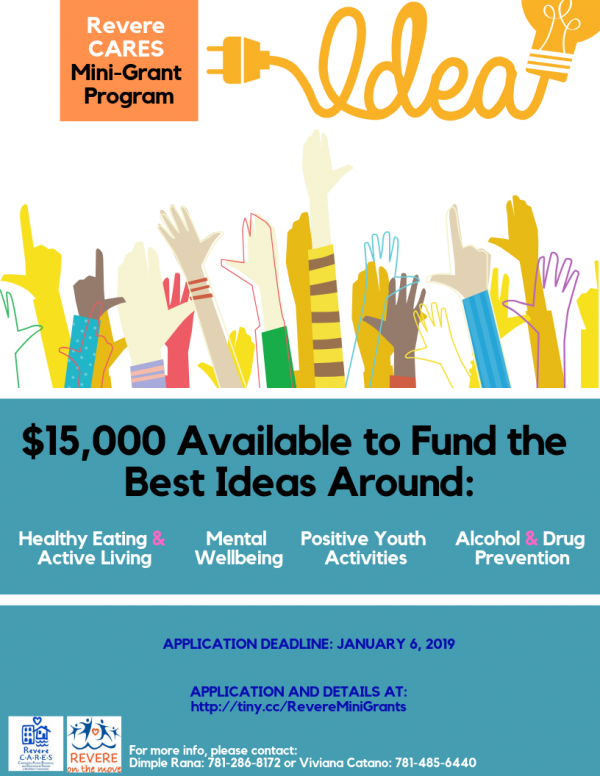 This year, $15,000 dollars are available for individuals, organization, or groups interested in receiving funds to promote healthy eating, active living, prevent substance use disorders, improve mental wellbeing, and engage young people in positive activities. “Our ultimate goal for these mini-grants is to put money in the hands of our community members to do things we may not have thought of or been able to do. Community problems require community solutions. The community knows best how to improve the health of the city, and what would work or not work,” said Sylvia Chiang, Director of Revere CARES. Sidewalk Butlers for Cigarette Butts: Awarded $852 to the Revere Community Committee (through The Neighborhood Developers) to install five cigarette butlers in the Shirley Ave. business district. This environmental strategy is meant to promote cleanliness and increase mental health due to an environmental change in the Shirley Ave. neighborhood. Improbable Players: Awarded $1615 to the Rumney Marsh Academy for a performance from Improbable Players. The show, presented by young actors who are in long-term recovery, incorporates dramatic performances and theatre workshops that help people recognize situations in their own lives and seek the help they need. “It’s important that mini-grant ideas outlast the funding. They should be sustainable with a lasting impact for years to come. Policy, systems and environmental changes are ways of modifying the structure of where we live to make the healthy choice the easy choice. By changing laws and shaping physical landscapes, a big impact can be made with little time and resources,” says Dimple Rana, Director of Healthy Community Initiatives and Co-Leader of Revere on the Move. While brainstorming for ideas, consider ones that will have permanent benefits for the community. These include changes to existing policies (e.g. requiring fruit options at school events), environmental changes (e.g. aquaponics lab & urban trails), and systems changes (e.g. starting a bicycle club & yoga hour). To ensure a smooth application process for applicants, free technical assistance is available to all who wish to apply. “We want to help the community’s ideas be as strong as possible and to make implementing them as successful as we can. If someone has an idea that they aren’t sure quite fits or needs assistance with the application, they can call or email us and we can provide guidance. The goal is to make these great ideas work,” said Viviana Cataño, Program and Communications Manager at Revere CARES. For more details and to complete the online application by January 6th, 2019, visit (http://tiny.cc/RevereMiniGrants). For assistance contact Viviana Cataño at vcatano-merino@partners.org and or Dimple Rana at drana@revere.org. The mission of the Revere CARES coalition is to strengthen the health of Revere by: Addressing priorities established by community members; utilizing an environmental approach; advocating for evidence-based, culturally competent strategies, programs and services; increasing connectedness among individuals and organizations, and supporting and empowering local youth. The Revere CARES Coalition is a program of the MGH Center for Community Health Improvement.